Southgate Windows offers the lowest supply only trade prices for aluminium patio doors. We are fortunate to have a strong working relationship with Smart Architectural Aluminium, one of the largest names in the aluminium industry. Contact Southgate for your aluminium patio door prices throughout Somerset and surrounding areas. Aluminium is becoming the must have double glazing product for homeowners. 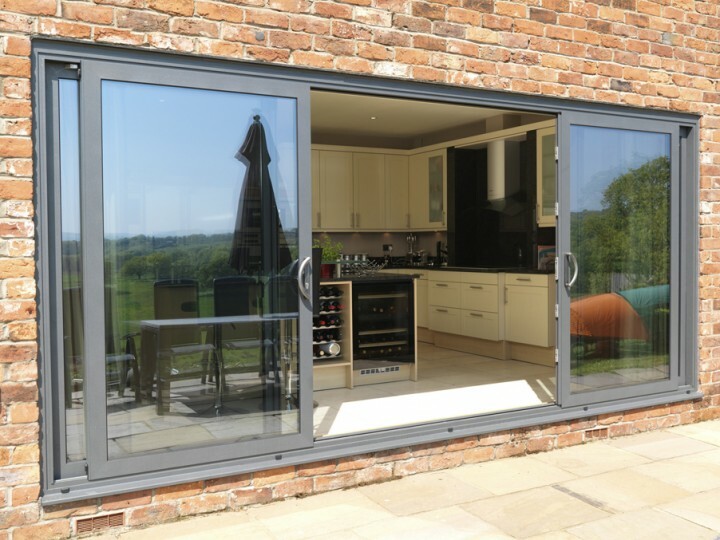 The sleek and minimalist appearance ensures aluminium patio doors complement all property types. Giving homeowners a quality entrance to their back garden, designed to reduce heating bills and improve security. Southgate Windows supplies our aluminium patio doors with specially strengthened thermally focused glass. For safety and increased energy efficiency. Our company is committed to offering the best customer experience and lowest trade prices for aluminium patio doors. Choose Southgate Windows for a hassle-free trade supply service for aluminium patio doors. A multitude of configurations available, can be used as an exterior door or a conservatory upgrade. Slim sightlines maximise glass coverage and increase visibility. Specifically designed to improve strength and weather resistance. Fitted with extended polyamide thermal break. The intelligent hinge design ensures the patio door does not intrude or take up much space in the room. A comprehensive range of colours available, including single RAL and dual. Low U-value of 1.8W/m2K. Fitted with secure 28mm double glazing. Smart Architectural Aluminium offer two separate guarantees for their aluminium patio doors. Covering the functionality of the door and the paint finish. Aluminium patio doors are guaranteed to last for ten years. However, a combination of build quality and intelligent design should result in the patio doors lasting much longer. Corrosion, except in the case of bending or folding after paint application. Southgate Windows offers the lowest trade prices for aluminium patio doors in our service areas. To get your no obligation quote for aluminium patio doors, send us an email via our contact form. We never pressure sale and pride ourselves on being a professional supply only company for trade. If you would like to find out further information about our aluminium patio doors or our supply for trade only service, please do not hesitate to get in touch. We are happy to answer any questions you may have, call us today on 01278 455326.